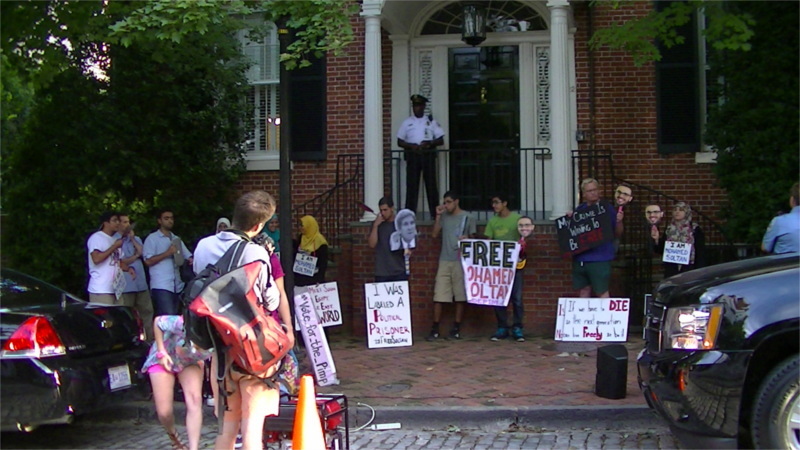 On the 25th of August, Code Pink and area Egyptians showed up outside the Georgetown home of US Secretary of State John Kerry. They were demanding that the US Embassy in Egypt take steps to demand that the illegal coup government of Egypt to release journalist Mohommed Soltan, who is a US citizen with family ties to Egypt. He has been effectively held hostage for a year, denied medical treatment for a bullet wound suffered while covering a protest, and has been on hunger strike. The government of Egypt receives nearly as much US aid as Israel, even though US aid to coup governments is illegal. The military coup regime in Egypt overthrew a democratically elected government by armed force in Summer 2013, then shot over 1,000 protesters opposing the coup. They only greater claim to "legitimacy" they have than those who killed another US journalist in Iraq last week is that they managed to sieze the entire country instead of just part of it! Part of the protest on August 25 involved projecting videos, and the Secret Service attempted to prohibit use of the generator needed to run the projector, claiming that the gasoline tank made it unsafe to run on the sidewalk. I then reminded them that larger gas tanks and engines were in their car and SUV in the street, at which point they permitted the generator to be set up in the street between these two parked cars.